If it's a tool you want, you'll find it here. We carry product from brands such as Milwaukee, Dewalt, Dremel, Empire, Forney, and much more. Location: Top building of our Wellington store presented below. Also available in Ashland, product may vary per location. 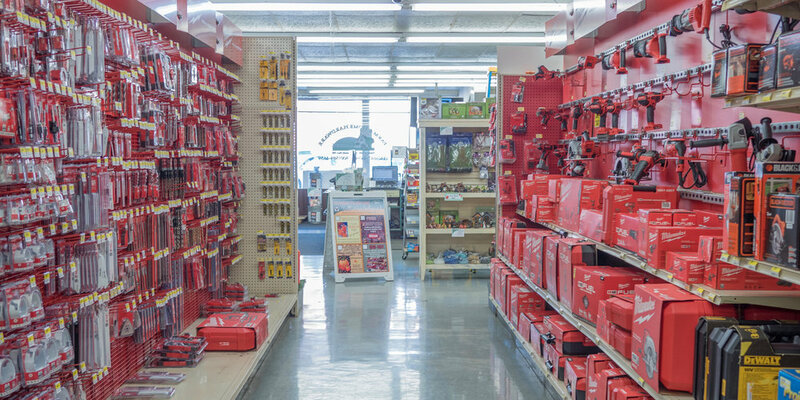 Perhaps one of the most recognizable sections of a hardware store, the tool department is a favorite among carpenters, contractors, hobbyists, crafters and more. We provide a vast selection of power tools, hand tools, metal working supplies, and so much more. Milwaukee power tools and accessories line the walls from top to bottom. The Tool Department features product such as hammer drills, impact drivers, circular saws, and more. Additionally, countless attachments are at your disposal to make the job that much easier. It may seem like a small thing, however using a quality level can make all the difference. Browse a large assortment of Empire levels with the assurance of a solid product at your finger tips. Although small, this tool is known to deliver a punch. Multiple models and attachment options are available.